We’ve been bulls on 30-year Treasury bonds since 1981 when we stated, “We’re entering the bond rally of a lifetime.” It’s still under way, in our opinion. Their yields back then were 15.2%, but our forecast called for huge declines in inflation and, with it, a gigantic fall in bond yields to our then-target of 3%. When first-generation ETFs launched in the 1990s—such as the SPDR S&P 500 Trust (SPY) and the PowerShares QQQ Trust Series 1 (QQQ)—lead this year's outflows, that is a sign that institutional investors are scared. These first-to-market ETFs have the ample liquidity that big institutions tend to love, with many trading more than $500 million in volume a day. While newer ETFs that may do the same thing or more for cheaper have been launched in the intervening years, early ETFs still tend to curry favor with large investors that value liquidity. 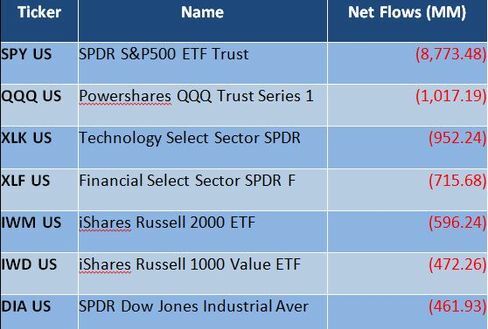 These investors tend to be more tactical, and thus outflows from these ETF stalwarts are a bearish sign. The U.S. posted a record cross-border investment outflow in June as China and Japan reduced their holdings of Treasuries and private investors abroad sold bonds and notes. The total net outflow of long-term U.S. securities and short-term funds such as bank transfers was $153.5 billion, after an inflow of $33.1 billion the previous month, the Treasury Department said in a report today. 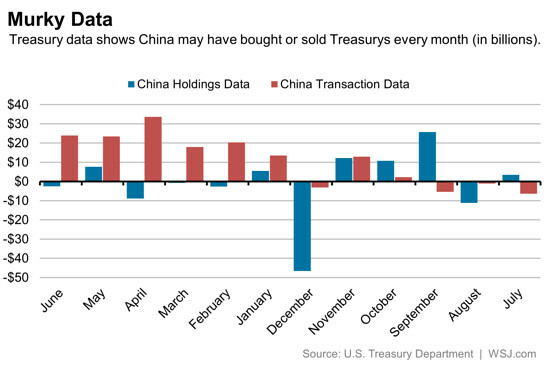 The June figure, and $40.8 billion in net selling of Treasury bonds and notes by private investors in June, were the largest on record, the Treasury said. Which Is Wrong? Bonds Or Stocks? Certainly it would seem not everyone believes the economy is strong enough to support future earnings and rising profits. Is the five-year bull run finally running out of steam?